Journalism in Greece is facing an “acute crisis” and is the most suppressed in the EU, according to a new report. Researchers from City University London and the London School of Economics (LSE) say the “intertwining” of powerful politicians and the media has severely damaged press freedom and independence. Previous administrations have created a media environment that is “chaotic on the surface but in fact deeply controlled by the state and by prominent private interests”. In extreme scenarios, media companies have “kept silent” about sensitive government news, such as the imposition of laws against employee rights and pension cuts. It is claimed the new SYRIZA government now faces a battle to restore the integrity of the industry. The report – by Professor Petros Iosifidis, Professor of Media and Communication Policy at City, and Dr Dimitris Boucas, of LSE – has been prepared for the Open Society Foundations’ Independent Journalism programme. “The intertwining of the political elite and the media has generated a journalistic culture that is cautious of reporting news that state officials could find challenging,” the report states. “These arrangements have damaged journalism, as state and private interests have steered editorial choices. The financial crisis and the austerity measures imposed since 2010 have served to strengthen these relationships. 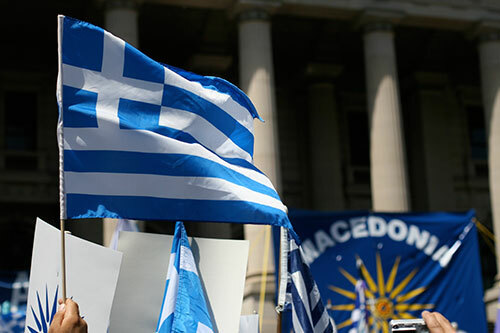 The study – published by Open Society Foundations on Wednesday 13th May – involved in-depth interviews with journalists, lawyers, academics, trade union representatives and other Greek media experts. The researchers say the problems worsened after the abrupt 2013 closure of public broadcaster ERT – the only broadcaster with a legal obligation to provide objective news coverage – which “contributed to a deteriorating landscape” of journalistic independence. Professor Iosifidis, of the Department of Sociology at City, said: “The newly elected left-wing SYRIZA government has passed a bill that allows the reopening of ERT. This is good news for both journalists and the public who deserve a truly public service for independent information. The researchers claim the internet has created a platform for “alternative voices” and offers “potential for strengthening pluralism and transparency”. However, the funding problems associated with traditional media are “replicated” online and the elite have therefore retained a level of control. “Indeed, such trends are visible, as is the proliferation of low quality, gossip-based, or blatantly plagiarized content from one internet site to another,” the researchers state. The academics also claim independent regulatory authorities have acted “superficially and ambivalently”, while regulation has been “ineffective”. Participation of non-professional bodies, like universities and NGOs. To read the full paper, Media Policy and Independent Journalism in Greece, click here.